[janth]’s build relies on semitransparent acrylic mirrors for the infinity effect, lasercut into triangles to form the faces of the icosahedron. The frame is built out of 3D printed rails which slot on to the acrylic mirrors, and also hold the LED strips. [janth] chose high-density strips with 144 LEDs per meter for a more consistent effect, and added frosted acrylic diffusers to all the strips for a clean look with less hotspots from the individual LEDs. An ESP32 runs the show, and the whole assembly is epoxied together for strength. The final effect is very future disco, and it’s probably against medical advice to stare at it for more than 5 minutes at a time. The infinity effect is a popular one, and we’ve seen a beautiful cube build by [Heliox] in recent times. Of course, if you do manage to build an actual portal through time and space, and not just a lamp that looks like one, be sure to send us a tip. Video after the break. Redditor [ squishy0eye] lacked a coffee table and wanted an infinity mirror. 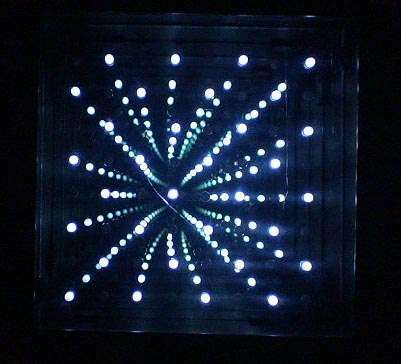 So, in a keen combination of the two, she built an infinity mirror table the resembles a nighttime cityscape. Skimming over many of table’s build details, [squishy0eye] paused to inform the reader that an MDF base was used underneath the mirrors, with a hole drilled for the future power cable. For the top pane, she overlaid privacy screen mirror film onto tempered glass, turning it into a one-way mirror. The bottom pane is acrylic plastic due to the need to drill holes to hide the cables for each ‘building’ — the same mirror film was applied here as well. Wood was cut into rectangles for the building shapes and super glued around the holes and in the corresponding spots underneath to prevent any bowing in the acrylic. A small gap was left in each ‘building’ to run the 5050 non-waterproof LED strips around and back into the hole for power. [chromationsystems] put out a couple instructibles on building infinity mirrors. One with an 8×8 array of LEDs and one with a 32 LED ring. These are very well documented covering the construction of the mirror enclosure as well as the circuit and code. The effect is quite nice. The 8×8 array is interesting, we haven’t seen that before. These would make a fine addition to any geek cave/electronics lab. While it looks like these were basically advertisements for a product he sells, you can definitely make your own from his instructions. We like this kind of advertising.